Yay! After losing in New York (again) my mood brightened quite a bit when I learned that I had won the Sunset Magazine Fresh Cheese Recipe Contest. There were two categories: Sweet and Savory - of course I chose savory, and concocted a puff pastry - ricotta - arugula -shiitake pocket with some spicy tomatoes on top. The prize? Tickets to the Artisan Cheese Festival in Petaluma this Saturday, plus the gala 8-course gourmet dinner that night, with town car transportation! Fancy! I've also been invited to speak at the Ricotta Seminar, to talk about my recipe with 40 guests. 1. Preheat oven to 425° degrees. Slice puff pastry sheets into quarters and place 4 on an ungreased baking sheet. Chill all 8 puff pastry squares while you make the filling. 2. Whisk together eggs and 1/2 cup water in a medium bowl. In a large nonstick skillet, melt 1 tbsp. butter over medium-high heat and swirl to coat pan. Add mushrooms, 1/2 tsp. salt, and the pepper; cook, stirring frequently, 5 minutes or until mushroom edges begin to brown. Stir in garlic and arugula and cook until arugula wilts. 3. Add egg mixture and cook 2 to 3 minutes, or until eggs are almost set. Fold in ricotta and let cool 5 minutes. 4. Spoon egg-ricotta mixture into center of each pastry square, dividing evenly. Place a reserved square on top, aligning the edges and pinching together. Poke center of each square with a fork. Bake 15-20 minutes or until golden brown. 5. Melt remaining 1 tbsp. butter in a medium skillet over medium-low heat. Add tomatoes and sriracha and cook, stirring occasionally, 15 minutes. 6. Transfer squares to four plates, then top each with 1/4 cup fromage blanc. Spoon tomatoes over fromage blanc, dividing evenly. ***Note: I'm not sure why, but Sunset seems to think it'll take 1 hour and 20 minutes to make this dish. No way! If it truly took that long, I wouldn't want to make it. I'd be willing to bet you can do it in 30 minutes or less. The EASIEST App: Mushrooms, Onions and Butter! Bring this in a saucepan to a mushy mess (five minutes??) and add two tablespoons of flour (stir it in!!! ), a cup of low-fat sour cream, a few squirts of lemon, a tablespoon or so of parsley and a shake or two of salt and pepper. Here we would say "salt and pepper to taste" but to be really clear, you will need to first taste your dish, then add a shake of salt, then taste again. And don't go crazy. Stir and taste and add and repeat. Like a tango in your kitchen. And definitely note that we'll be adding a lot of parmesean cheese over the top of this and stick it in the oven. This means a lot more salt will be added, as parmesean cheese is a very salty one! So be super careful with seasoning. There are so many dip recipies that take two seconds to make, or pick one up in the deli section. Put the dip in a fancy dish and make your guests feel special. Dunk carrots, celery and other creative veggies. Just remember that they are there to see you, visit with each other, and relax. The food is just a perk. Make the presentation special and the food simple--- they'll love it. Mix one cup of loosely packed blue cheese and one cup of buttermilk together with a fork. The mixture will start to loosen up and turn an ugly shade of moldy blue/green. It will look more appetizing soon, don't worry! Mix in the remaining ingredients and be sure to add a fair amount of pepper. This is my favorite part of the dressing. Before proclaiming it finished, stick it in the fridge for a while, at least an hour, and let the flavors meld together. Retaste- you may need to add more spice. This lasts for at least a few days and is soooooooo good. Why isn't there a company that delivers breakfast? Like Dominos but better... I was thinking about breakfast in bed this morning. I'm a fan of whole grain and low sugar breakfasts. And coffee. Lots of coffee. We rarely celebrate the 'event' of breakfast. I love breakfast in bed, or breakfast with the family before opening presents on Christmas morning. My dad likes to do "short order cook" breakfasts with pancakes and eggs hot off the grill. By the time the last set of pancakes and eggs is made, the others have gone cold. So our tradition is to eat them as they come. Informal. Good. Fruit salad. Prepare everything the night before EXCEPT the bananas and strawberries. Add those in the morning. Toss with fruit juice to freshen it up. Plop some whipped cream on top. Strata. If you're cooking for a big group, breakfast strata is elegant and hearty. There are so many great recipies for this traditional breakfast dish. It's like a breakfast lasagna. Layers of bread, spinach, sausage or bacon, cheese. A one-pot meal. The great thing about strata is that it must be drenched in beaten eggs overnight to soak the entire dish, and pulled out to bake in the morning. Hard to mess this dish up!!! Coffee bar. Spice up the morning coffee with a selection of accessories (garnish!) such as cinnamon, cocoa powder, whipped cream, or the fixin's for Irish Coffee. This also works with tea. Decor. Throw on a tablecloth and dress up the table with some white roses. Pull out those funny little bowls you've never used, or the teacups your grandmother gave you. It doesn't take much! 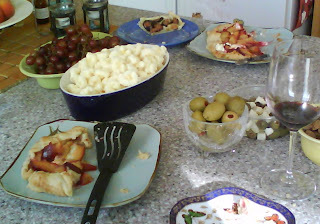 A while back, Jen made her "Saucy Tart" (which says quite a bit about the author, natch), and it was good. But now, because Fall is in the air, I wanted to make something a little more meal-like with the puff pastry languishing in my freezer. The thing to remember about tarts, galettes and the like is that there are no rules. They're really just open-faced pies. Simply take a bunch of flavors you like (that you think will go together), chop them up, and sprinkle them about. Here's what I did: * Thaw out your puff pastry first, as it's super hard to deal with and will crack if it's still frozen. * Preheat your oven to 450, and bake a sheet of it on a (greased) cookie pan for ten minutes. * While it's pre-baking, gather and chop your fillings. * Sprinkle your fillings evenly over the pre-baked sheet of puff pastry. * Take another (raw) sheet of puff pastry and cut it into whatever shapes suit your fancy and place them on top. * Bake for another ten minutes. Slice and serve! Congrats Jamie and Family for sweeping the fair contests! Woohoo!!! And she didn't mention that it was one of the hottest weeks we've seen here in the Valley. This week, completely tired of the 100+ degrees (and a horrible a/c), I decided to do a weeklong ban on cooking. With my stove, grill and oven off limits, what is there to make? I made some fantastic salads, sandwiches, got creative with leftovers, and overall had a fun time experimenting with cold options. One of my favorites-- instead of baking a dessert for the 4th of July, we had a fantastic fresh fruit salad with raspberries, plums, peaches and melon (all really sugary and sweet), and spooned large quantities of homemade whipped cream on top. To make it a little more classy, I added a splash of Grand Marinier in the whipped cream. Wow it was good. And not that bad for you either. I also went very rustic one night for dinner, pulling out the old-school Italian sandwich idea and revamping it with a Napa flair. I bought a skinny baguette and fresh (in water) mozzerella, clipped some fresh tomatoes and basil, and made a really nice and basic sandwich. I mixed up a clove of minced garlic and a large amount of fresh chopped basil with some olive oil, salt, pepper and balsalmic and let it sit for a while. In the meantime, I thinly sliced the cheese and tomatoes and then tossed them in with the mixture. I let the whole thing marinate for a while and put it on bread. Wow so good. And really fresh flavors. Very filling and balanced meal - carbs, protein from the cheese, veges. Sometimes simple is a really good thing. In a smaller quantity this could easily be an appetizer, but why not make it a meal? Baking and cooking require time, technique and personality. If you haven't guessed already, I'm not a detail-oriented person and I love recipies that allow creativity in presentation. So rather than putting together a tart (often these look like super-glazed thin pies with meticulously arranged fruit designs on top), I like baking galettes. A galette is the messy version of a tart. And it sounds so French. So fancy. So now we make a free-form tart, using the following technique, and involving ANYTHING you want for the filling (I'll explain later). Lay out the frozen pie crust on a cookie sheet. In the end, we want to fold the edges up and over the filling, by about an inch. Crumble a generous layer of cheese into the middle of the pie crust. Chop and crumble a nice amount of fresh thyme or rosemary on top of this layer. In a bowl, combine thinly sliced fruit, olive oil and salt. Taste and add sugar if needed, based on sweetness of the fruit. Put the fruit on top of cheese in a thin layer and wrap the edges of the crust up and around the fruit. Pop it in the oven at 375 for about 40 minutes, maybe more(check it after 30 to make sure the crust isn't overcooked). This is soooooo good. I made it last night for a dinner party and tried three different combinations. Goat cheese gets really creamy when it is cooked, but the flavor of the gorgonzola and figs with rosemary was the crowd favorite. Now the great thing is that this Galette idea is super simple, and can be modified to be a dessert. Thinly slice apples. Add cinnamon and sugar, perhaps some currants too. Add about two tablespoons of flour. Toss and use this as your filling. The only secret you need to know is that when you use a runny fruit (apples get really juicy when you cook them - and peaches may just not work for this), you need to add some flour. Otherwise you will have serious issues with the crust, and may have a big puddle in your oven when you're done.